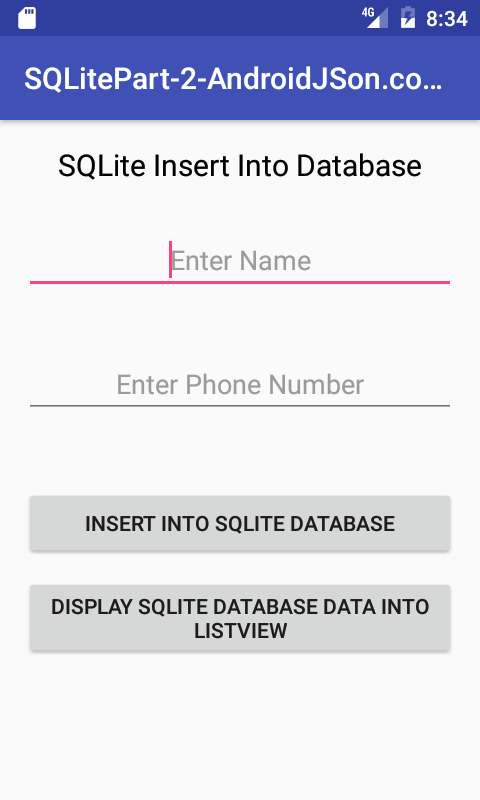 This tutorial is the third part of advance SQLite database example, In this tutorial we would going to execute simple basic operations on SQLite database like Add Data in SQLite database, Showing SQLite database data into custom ListView, Selecting SQLite Data on ListView click, Updating( Edit ) SQLite database data and Delete SQLite data. 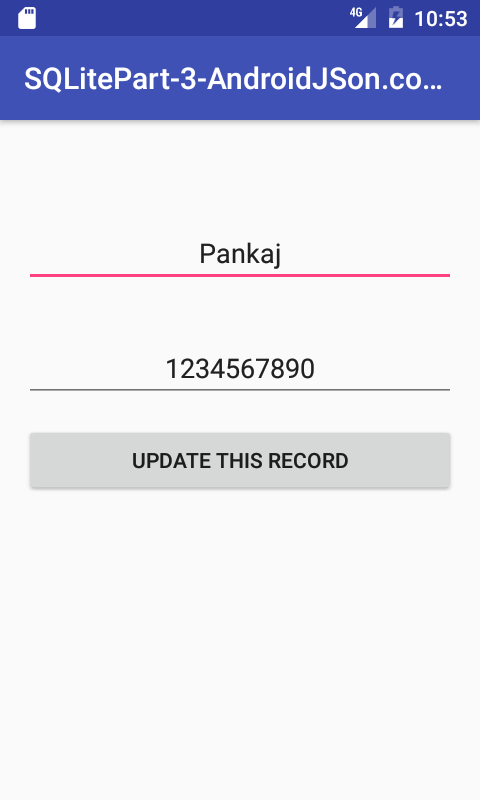 So here is the complete tutorial for Android SQLite Select Insert Update Delete Display Data Tutorial with Live demo and all the source code you need to learn this tutorial. Inserting Data into SQLite Database – SQLite Part 1 . Showing SQLite data into Custom Listview – SQLite Part 2 . Creating Table in SQLite Database. Inserting Records in SQLite DB table using EditText. Display all the SQLite Database Data in Custom ListView. Open any record on ListView click. 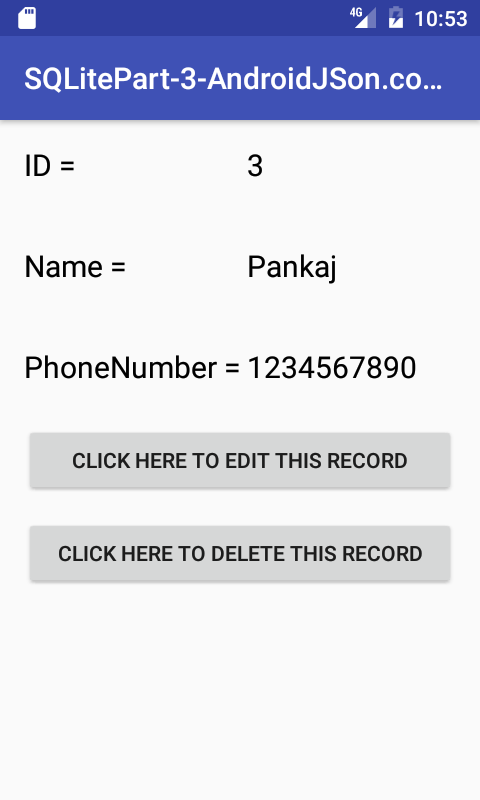 Update(Edit) SQLite database single selected record using EditText. Delete Selected record on button click. 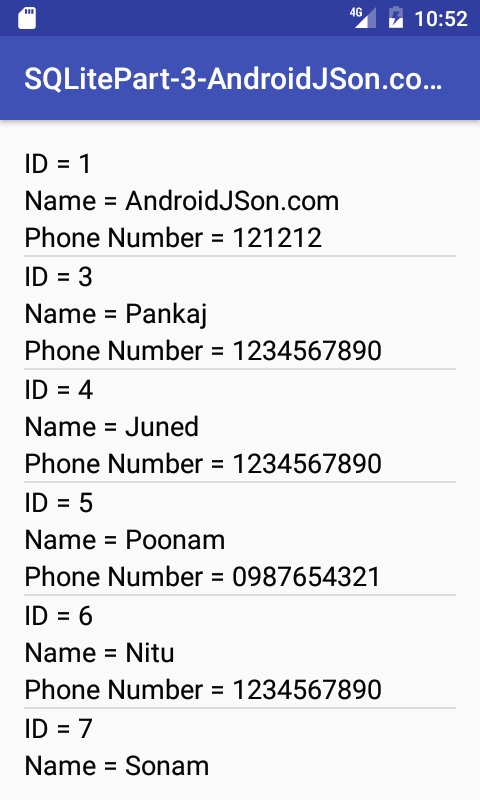 android:text="Display SQLite Database Data into ListView"
//Inserting Column ID into Array to Use at ListView Click Listener Method. Code for activity_display_sqlite_data.xml layout file. Code for activity_show_single_record.xml layout file. android:text="Click Here To Edit This Record"
android:text="Click Here to Delete This Record"
Code for activity_edit_single_record.xml layout file. Code for items.xml layout file. * Created by Juned on 1/23/2017. Zaima just create a new project and create new activities like i did and place all the code there.